He was one of the most beloved performers in music history, a spokesman of the people and poet laureate to cab drivers, housewives, and commonfolk alike. Taxi is the definitive biography of Harry Chapin, written by his long-time friend and confidant. 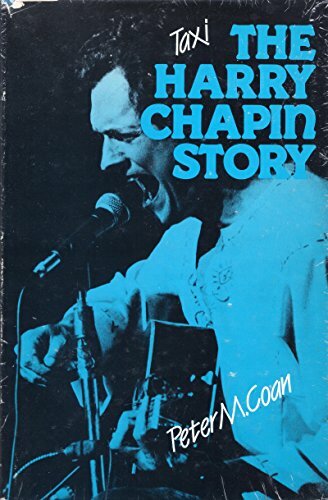 Chapin was an unsung hero, a modern-day Woody Guthrie. The recognition due him was late in coming. Awards are being given to Chapin in his death that he should have received while he lived. His music, his beliefs, and his social activism are finally being appreciated. Most of the world will remember Chapin for the "Story Song; ' the musical genre he popularized in one of his most famous songs, "Taxi". His unique appeal could be felt in concerts, for it was there that the real and dynamic Chopin emerged. His penchant for audience participation was his trademark. His performances often ended with tumultuous standing ovations; when the audience quieted down Chapin would stand center stage and give a short speech about his commitments. Often people drove hundreds of miles to hear him, making him one of the highest paid performers in the world. Even so, due to his selfless humanity and indefatigable interest in social causes, Chapin did not leave much money behind when he died. His involvement with world hunger helped spur widespread interest. He lobbied in Congress to endorse a Presidential Commission on world hunger. It was no coincidence that after his death 30 congressmen and 10 senators rose on the floor of the House to offer eulogies. Ironically it was the automobile, the very thing that made him famous in the song"Taxi, "which took his life. He died on the Long Island Expressway when his car burst into flames after being hit by a truck.